The president has a BlackBerry through a compromise that allows him to stay in touch with senior staff and a small group of personal friends. Good stuff. Now how is RIM going to work this into a marketing campaign?! For more details you can click here. Hopefully this concludes the will he get to keep it or does he have to give it up saga. The issue of whether or not Barack Obama would be allowed to continue using his BlackBerry once sworn in as President of the United States of America has been all over the mainstream media for the past few weeks. What's the verdict? I don't think that has fully been decided yet, but Charles Ommanney for Getty Images for Newsweek got a picture of President Obama after the parade yesterday checking his email on his BlackBerry. This is after he went from being President Elect to the President. According to ABC World News ( via Mobile Crunch / BGR), it does looks like he'll be able to hold onto his BlackBerry for personal use... at least for now. 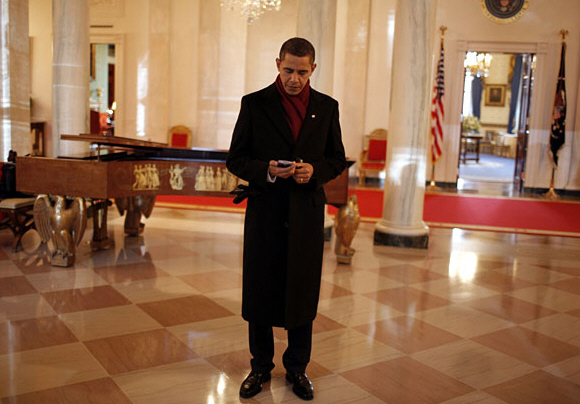 One thing is for certain, if Obama does have to give up his BlackBerry altogether, he won't do it without a fight.